Every now and then in everyone’s life we get distracted by things that we either cannot change or that shouldn’t matter to us to begin with. The distraction can cost us time, emotional energy, mental fatigue and more. To increase the quality of our life and the sense of serenity in our days, it’s worth reviewing the simplest of lessons so we can keep our mental and emotional outlook fresh. The past cannot be changed… and quite thankfully so. Every time I’ve talked with someone who says, “I wish I could just go back and change…” anything, I have to open my mouth and explain why I think that the thought is nice but the reality might not be. We never know what else we would change in our life if we could go back and change just that one thing. And even while we think about it at times, the reality is that we can’t. The past is what it is. It’s the past and it’s not within our power to change. The best we can do is learn from it. Fretting about it; regretting it… neither will change it and will cost us emotional peace and energy. Leave the past where it belongs – in the past. Move on into your future. The opinions of others don’t define you… even if those others really believe they do or wish they would. Reality is that no matter how good of a person you are; no matter how great your motivations; no matter how generous your actions or charitable your thoughts… No matter how positive and beneficial you are in someone’s day, there will come a time where their opinion is less than charitable toward you. Depending on their character they might keep that opinion quiet, or they might spout it everywhere to anyone who will listen. It doesn’t matter. It’s just their opinion. People who focus on spouting negativity are identified pretty quickly and usually end up ignored. Judgments are a confession of character… for those who judge you and you when you judge others. Why? Because our own values and belief structures are what we base our judgments on. Our own morals and character are revealed when we voice judgment of anything or anyone. This isn’t a speech to convince you not to judge others or things. It’s a caution statement to think before opening your mouth to voice such judgment. Not only do you reveal your opinion (see above) but you also reveal your character. What is it that you’re revealing about yourself as you do that? Everyone’s journey through life is different… which is something that needs to be remembered before you pass judgment on how they’re living their life AND before you worry about what they think of how you’re living yours. Even those closest to us, whose opinion and judgment we may consider of value, can’t be completely accurate with regard to our circumstance. They have not lived our life. They don’t have our experience. They don’t have our knowledge. They don’t have our perception. Even if we’re talking about a twin sibling who has lived right next to us for our entire life, their outlook and experience are still different. Anything they offer in the way of opinion, judgment, observation, advice, etc. has to be viewed through the filter of our own experience. Any of that we offer to them also has to be filtered through THEIR experience. What goes around comes around… and it usually keeps its emotional energy. So, if it was positive it’ll come around that way. If it was negative, it’ll come around that way. As one man put it, “We live on a wheel and it continually spins. People get on; people get off. People put things on; people pull things off. What goes around comes around and we eventually end up getting back what we gave.” Interesting perspective. What are you putting onto the wheel of life? Positive thoughts create positive things… “A negative outlook never created a positive day.” It takes a positive outlook and a positive approach toward anything to create something positive. That positive energy starts with you; inside you; with your outlook, confidence, courage and determination. If you start out to do something thinking you can’t do it then you hurt your chances of success. If you start out thinking that you will succeed and having your plan to do so, your chances of success are greatly increased. Be positive. It helps create a positive (and happy) life. You only fail if you quit… So many champions have admitted that their success is only due to the fact that they didn’t quit after they failed as they were learning how to do whatever they became champions at doing. The best baseball players struck out thousands of times before hitting hundreds of homeruns. The best basketball players missed thousands of free throws before making hundreds of them. Every champion was, at some point in their life, a beginner; an amateur with no skill. What made them great? Determination, practice, diligence and their absolute refusal to quit. You have not failed until you quit. So if you want to succeed, you simply never quit. Happiness is found within… and no matter how hard we wish for it, expect it from someone else, look for it in anything external, this truth remains. Happiness in life and with yourself starts within yourself. A great many people have looked all around the world for sources of happiness. They’ve tried other people, natural and synthetic substances, wild and tame experiences and more. They keep looking for that one thing or one person who can make them happy when all they need do to find them is look in the mirror. Smiles are contagious…but only if you let them be. The smiles of others can bring a smile to your face. The happiness of a beloved pet can do the same. The smile on your face can be cause for someone else to smile. If you doubt that smiles are contagious, I ask you why they wouldn’t be? We’ve all experienced sharing sadness with a friend or loved one. Share sadness is sadness halved, while shared joy is joy doubled. Share your smile and see it reflected back… and feel it grow. Kindness is free… sprinkle that sh*t everywhere. It’s a fantastic saying and outlook. It costs us nothing but some minor effort to be kind. It may require us to be less judgmental or perhaps less opinionated. But in the long run, it comes back to us and has a positive impact on our life (see the notes above about living on the wheel, spreading positivity and more). Kindness has no price but is of ultimate value. Things always get better with time… even if it doesn’t feel like it. When people say that “Time heals all wounds,” it’s usually because they’ve unfortunately experienced it. Time may not heal wounds, but wounds do heal over time and as they heal they hurt less. Eventually we’re left with a scar; that reminder of a wound we once experienced; a lesson we once learned. Broken bones heal stronger at the break. Skin heals with a scar and that scar is thicker skin that is stronger and more resistant to future injury. Things… WE get stronger with time especially if we’re overcoming adversity or challenge along the way. Overthinking will lead to sadness… because it leads to inaction. A lesson I’ll never forget was my senior year of high school studying Hamlet. That poor guy. He kept thinking faster and faster in smaller circles but he was frozen by what we today call “analysis paralysis.” He just kept thinking about everything that had happened and everything he might do but he never DID any of it. His lack of action ultimately led to his unhappiness… as it can with ours. A wise military leader once said, “A good plan executed today is better than a perfect plan executed at some unspecified time in the future.” Give your situation a look; think about your options; pick the best one and do it. Don’t remain frozen because you’re thinking about everything so in depth that you never act. 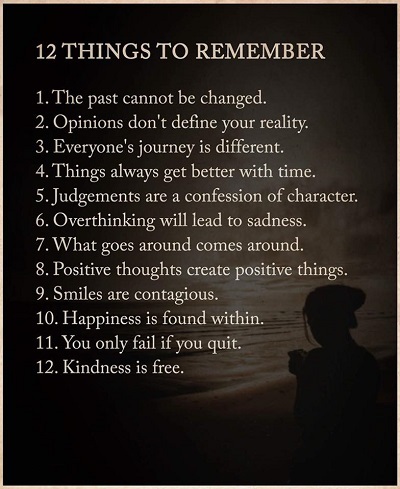 Those twelve things, if remembered and practiced can lead to a much happier much more productive and more peaceful life. We all need to work on one or more of them. Make it happen.